We’ve all heard of FOMO, the term coined for the fear of missing out. It’s that feeling when you’re at home and it feels like everyone else is out having fun. 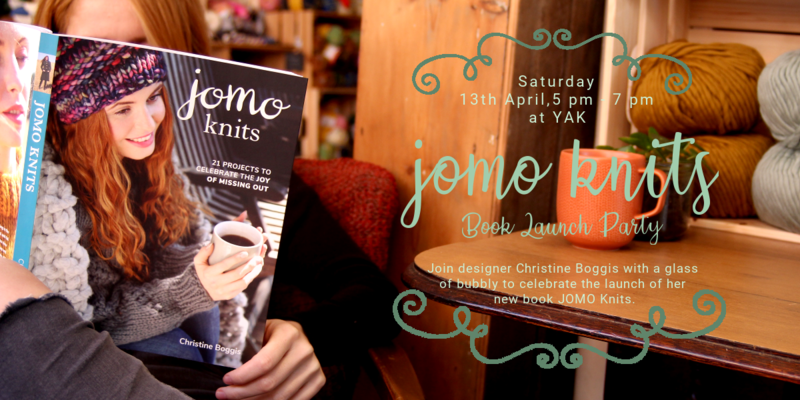 In her new book JOMO Knits, Christine Boggis is turning that phrase and feeling on its head. The book is all about the joy of missing out, celebrating time to stay in, slow down and and enjoy a cosy project with a cup of tea. We are so exited to be celebrating the book launch at YAK in just a few weeks time. Come along to meet the author, see the projects from the book in person along with a cheeky glass of bubbles too. The event is taking place on Saturday 13th April, from 5pm to 7pm and we would love you to join us. In anticipation of the launch here is everything you need to know about the author, the book and the projects inside. Christine Boggis is a Brighton based mum, journalist and knitter. She is passionate about taking time to slow down without the pressure often put on people through social media or marketing messages to always be busy having fun, eating photogenic brunches, going on weekends away or owning the latest product, while of course documenting all of this on Instagram. This often leaves people with anxiety that they are missing out or aren’t in the loop, or with FOMO as it has been labelled. Christine struggled with FOMO in her teens and late twenties and has since fought back against this by embracing the joy of missing out. Now she loves nothing better than a night at home in front of the TV, always with a knitting project and a cup of tea and this mindset has inspired the book. As mentioned above, JOMO is the Joy of Missing Out, and JOMO and knitting are the perfect match. JOMO Knits is about making something slowly that you or someone you love can treasure forever, or just for the sheer joy of making something. It’s about sitting at home being content that, if you are missing out on something, it’s not as good as what you’re doing right now. 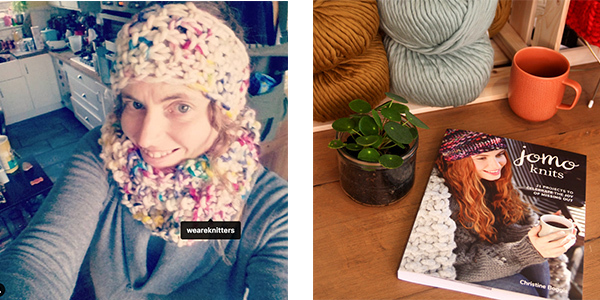 The book is a collection of 21 gorgeous knitting patterns split into three sections; Nest, Explore and Share. 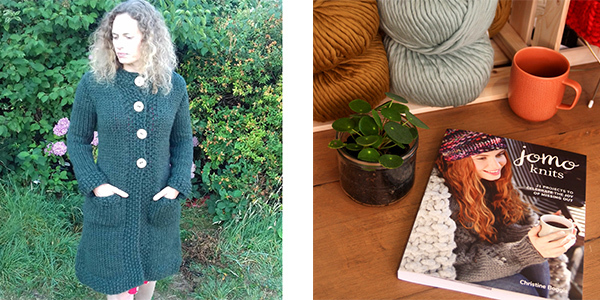 Alongside the patterns are insights on how to use knitting to unwind from the relentless demands of out over-stimulated and digitalised lives and rediscover how to connect with ourselves, and those around us, in a more meaningful way. The designs aim to be accessible to beginners but interesting enough for knitters of any level to enjoy.